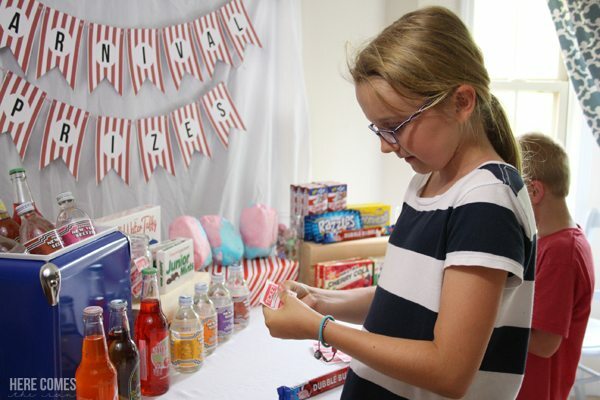 Inside: DIY Carnival Games. 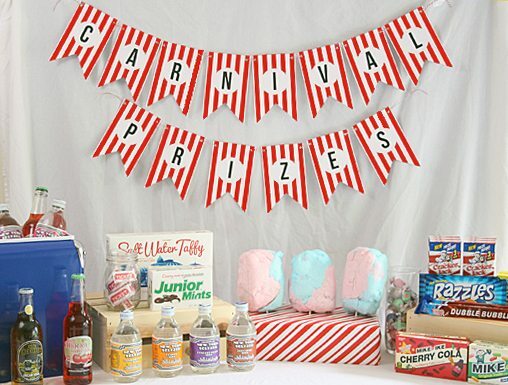 Thank you to World Market for sponsoring this Carnival game ideas post. Let’s take a road trip. Let’s go way back to childhood when your parents packed you and your siblings into the way back of the Chevy Wagon with wood paneling. The one with the flip up seats in the back. Every kid fought over the way back, right? At least that’s how it was in my family. Where did you go on your road trips? Did you ever take a trip to the ocean boardwalk? Beach boardwalks are the quintessential summer experience (in my opinion). The smell of the ocean, the sounds of the whirring rides and the clinks of the bottles as beachgoers try their hands at the ring toss to win a stuffed animal that is so big it needs to be strapped to the roof of the car on your way home from Wallyworld. When we lived in Maryland, we took several road trips to Ocean City. Our daughter was 2 the last time we went so she doesn’t remember anything. We now live at the beach in NC but the kids have only been to the boardwalk once a long time ago. And to be honest, I wasn’t really impressed with the boardwalk here. 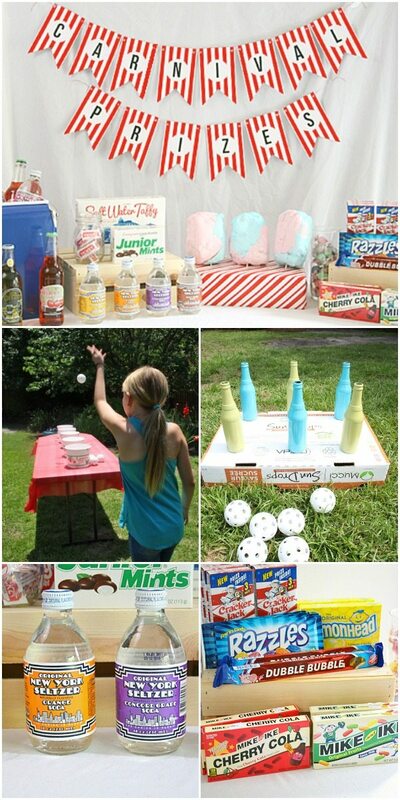 Unfortunately, we won’t be going on any road trips this summer so I decided to recreate a summer road trip experience in our backyard, complete with a beach boardwalk style DIY Carnival game ideas. Ladder golf is one of our favorite games to play as a family so I knew I wanted to include it in our DIY carnival game ideas. It is very easy to make using PVC pipe and you can get the ladder golf tutorial here. Players take turns throwing the golf balls and trying to hook them onto the ladder. The games usually last until one player or team receives a certain number of point. For our carnival, each kid had 3 turns to get as many points as possible. 3 points for the top rung, 2 points for the middle and 1 point for the bottom. 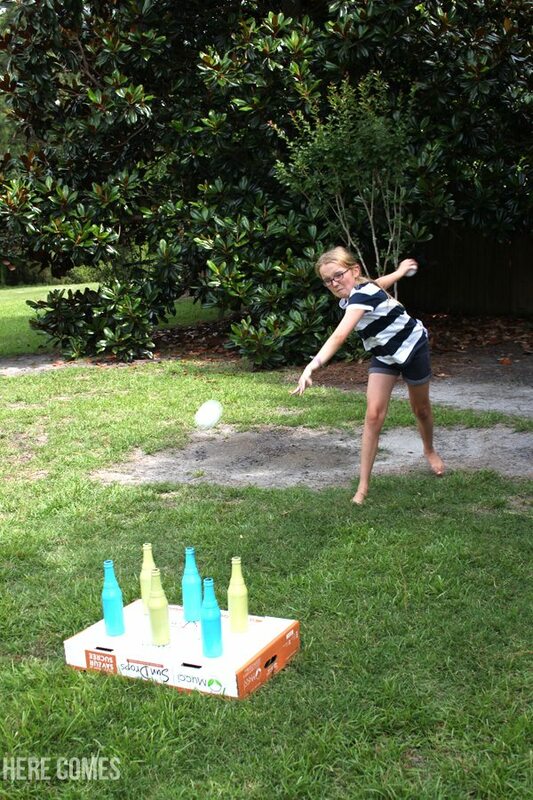 There are several ways that this DIY carnival game can be played but I chose to use whiffle balls to knock the bottles over. 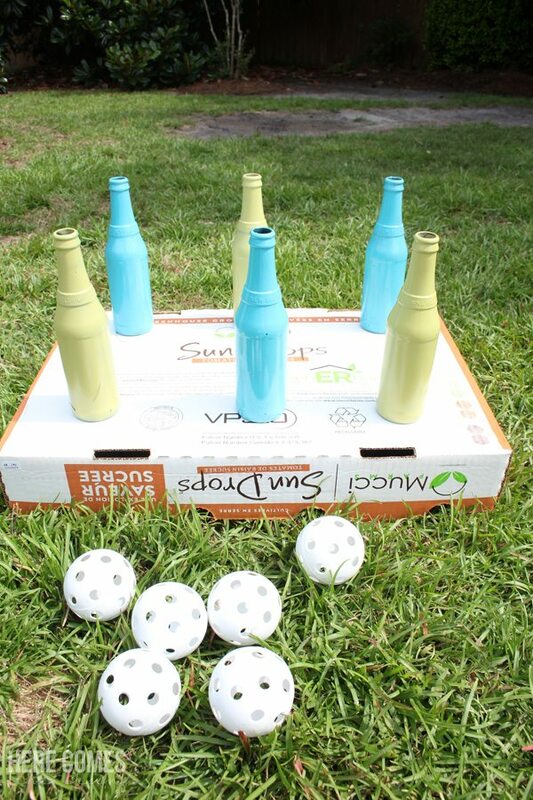 I spray painted the bottles with bright, fun colors and set them up on a cardboard box. You can put them on a table but I wanted something close enough to the ground so the bottles had less chance of breaking when hit. You can also use plastic bottles filled with a bit of sand or water. 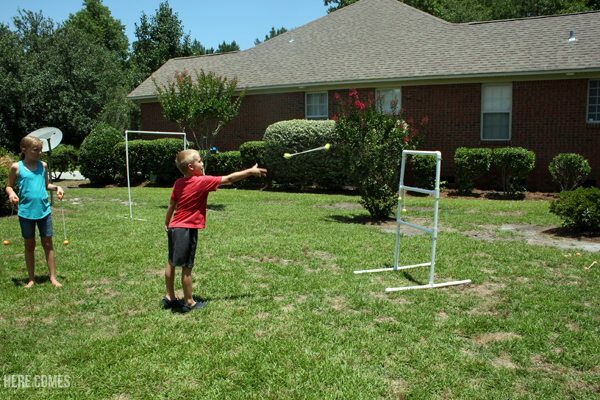 I used whiffle balls because… well because they’re whiffle balls and not real baseballs. Shards of glass in the grass are no good. To play, each kid got 6 balls to knock down as many bottles as they could. We played about 3 or 4 rounds. This easy carnival game goes way back to the Bozo the Clown show. 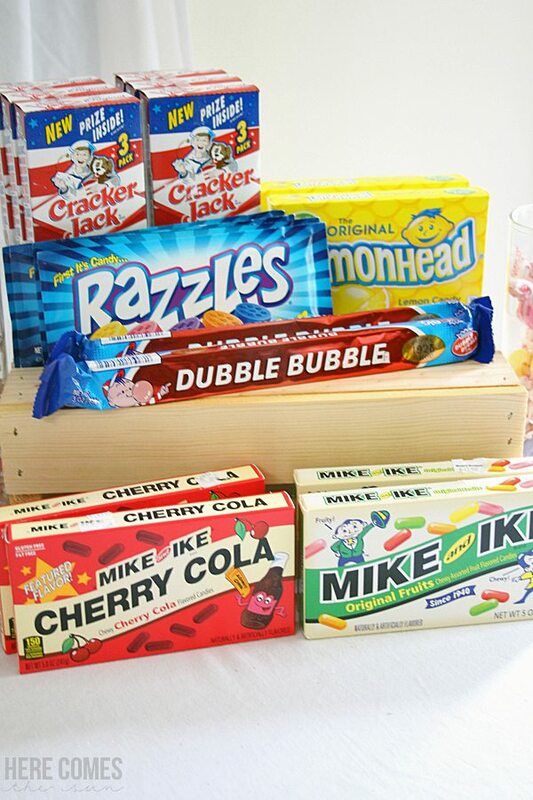 Remember the Grand Prize game? 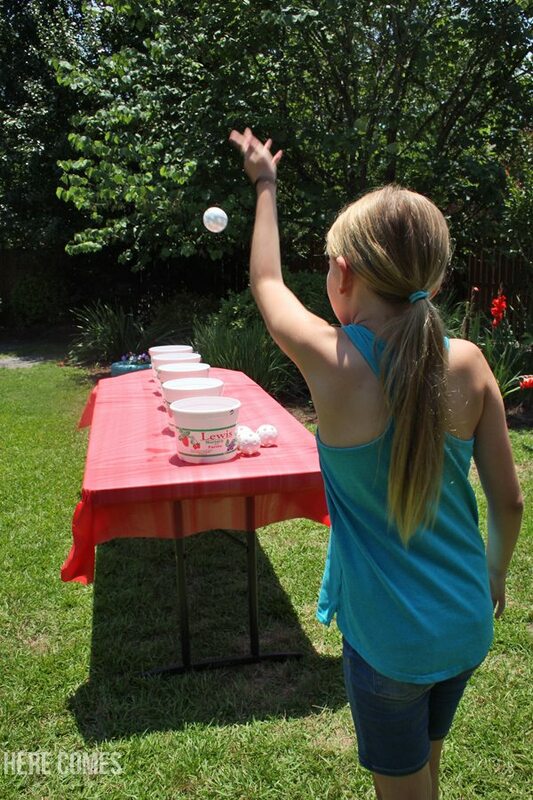 For the bucket toss, I used buckets that we had around the house and the whiffle balls. 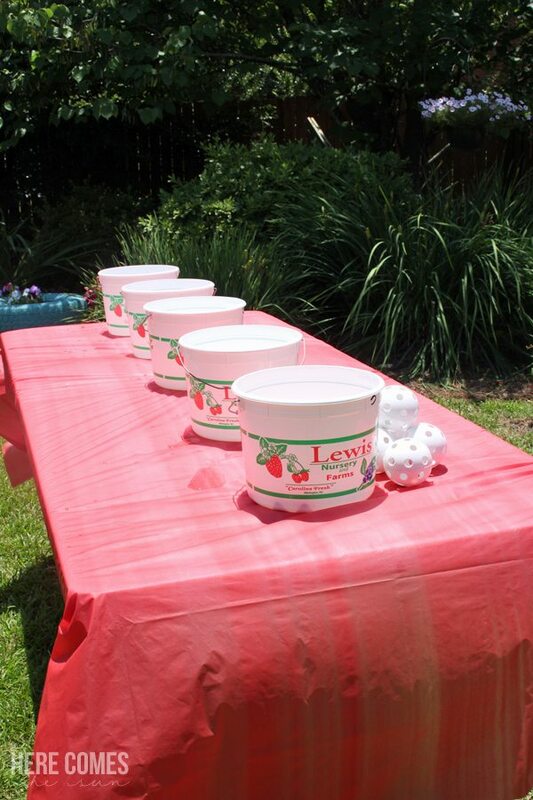 We designated each bucket worth a certain amount of points ( 1 point for the closest bucket and 5 points for the furthest bucket) and tossed the balls into the buckets. Each kid got to play a few rounds. There are many other games and toys that you can use for your DIY carnival games in the outdoor living section at World Market. Some items that would work well for a carnival would be the bean bag toss and ring toss. These weren’t available at my local store but they would possibly be available at yours so definitely check out that section of World Market. After the kids gathered all their tickets from the games, they were allowed to cash them in for carnival prizes. This was, by far, their favorite part of the afternoon. I set the “price” for each item after the kids had won all their tickets, mainly because I didn’t want items to be too far out of their reach. 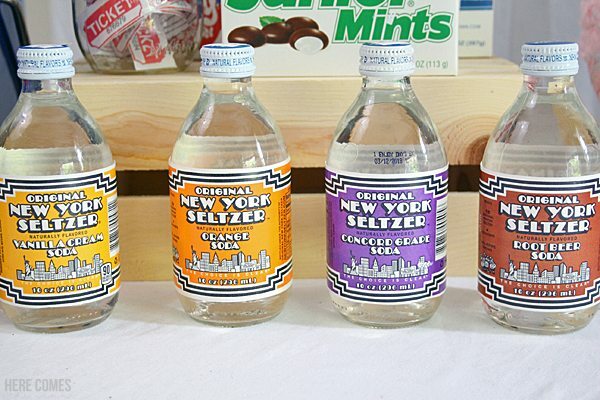 Items ranged from 1 ticket for the salt water taffy to 7 tickets for the bottles of Cherry Limeaid, Orange Soda and Cream Soda. The setup for the prizes was really easy with items from World Market. Currently, World Market is featuring their Road Trip Across America promotion. I headed to my local store in Wilmington, NC and found road trip snacks from all different areas of the country. I chose specific items that reminded me of my childhood and that reminded me of beach boardwalks and carnivals. You can obviously choose anything you want but these are my favorites. Click here to find your nearest World Market store. 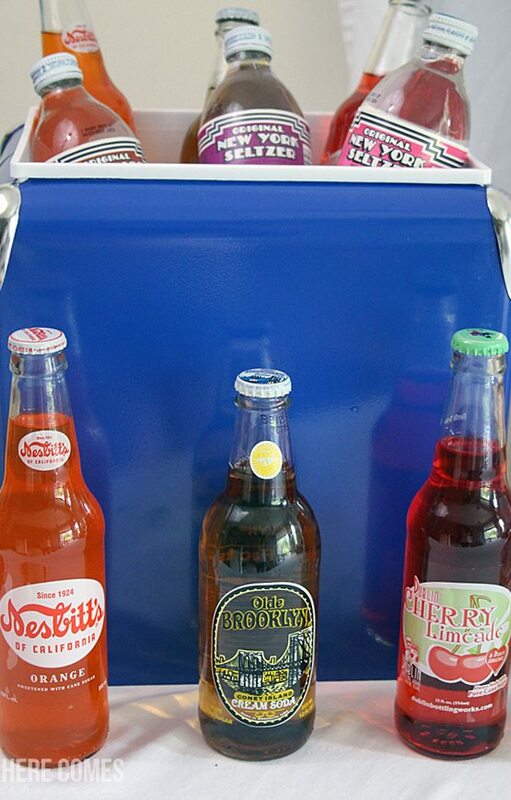 These little treats were a great way to end the DIY carnival games! The kids eagerly counted out their tickets and shoved them into the ticket jar so they could get their hands on their prizes. I made sure to get at least 2 of everything so there would be no fighting. Because nothing ruins a road trip more than sibling fights. BE SURE YOU PIN THIS FOR FUTURE REFERENCE! Will YOU be taking any road trips this summer? If not, try planning one right in your back yard! Want to win an amazing road trip for your family this summer? 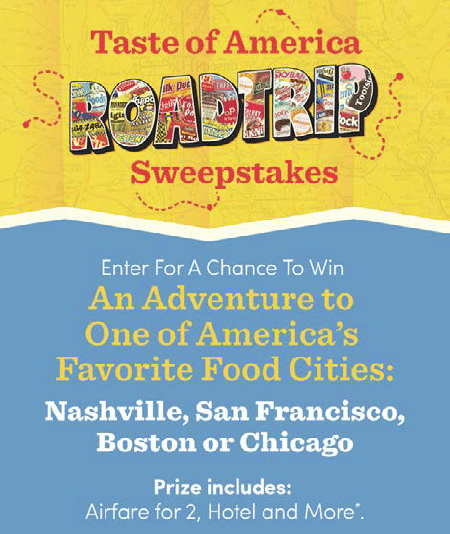 Be sure to enter World Market’s Taste of America Road Trip Sweepstakes! Click on the image below to enter! PS. The party doesn’t stop here check out our Pineapple and Flamingo Pool Party for another fun and cute summer party idea! I love DART BALLOONS. 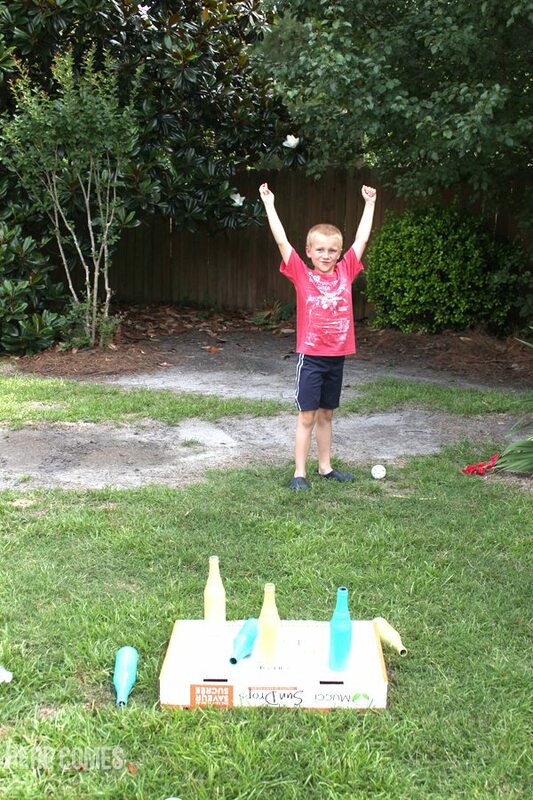 To set up your own dart balloon game you’ll need balloons of course, pushpins, a cork board, and a few darts. Simply blow up the balloons and use push pins to attach them to the cork board. For an added bonus you can stuff some balloons with bonus prize tickets. Oh my gosh, how creative you are! This at-home carnival looks like so much fun! This is so clever! So many cute ideas! What cute and fun games – I really love the bucket toss especially. Great ideas!! Love this! So many great ideas!